"Because ScreenSteps is so easy to use, we have more authors contributing to the knowledge base content. And because it's so fast, we are able to create content in 1/4 of the time." Brigham Young University - Idaho (BYU-Idaho) has the same challenge as every other university when it comes to teaching students, parents, and faculty how to use campus technology. We were thrilled when they decided to use ScreenSteps to help them face those challenges. The biggest challenge Arlen Wilcock, BYU - Idaho's Faculty Technology Consultant, faced was content creation. His team was using Adobe InDesign to create PDF guides. But InDesign wasn't very intuitive for all of the student employees, so only a handful of his staff were able to create documentation. I only had 3 students who knew InDesign. So any time we wanted to make a change, even though a person might know the steps, we had to wait for one of the 3 students to come in and create the document in InDesign. The whole workflow process was laborious and it took so long for us to make any changes. Not only was creation cumbersome, but so was trying to make any changes thereafter. The next challenge Arlen and his team faced was the format of their documentation. The output was a PDF. Initially we thought, “That’s what faculty will want.” We figured that faculty would have the PDF sitting on their computer and whenever they needed to remember something, they’ll just open up that little quickstart guide and use it. But that’s just not how people work anymore. If it’s not available online where they are at, and easy to access, they’re not going to go there. 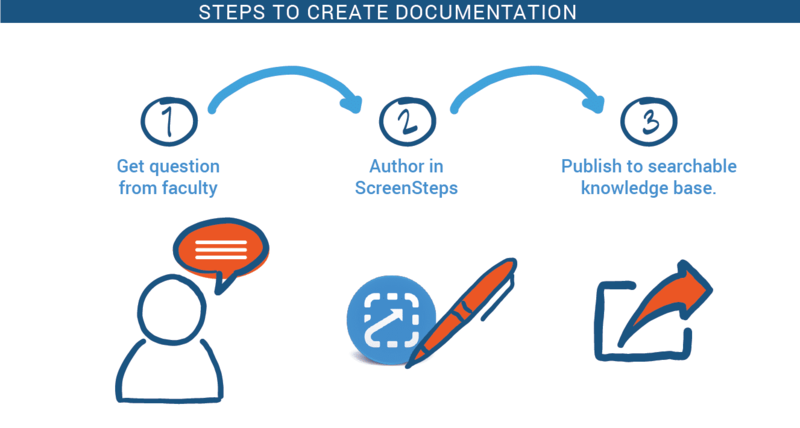 Arlen noticed that another department was using ScreenSteps, and he saw how quickly they were able to create the documentation. When he tried it out for himself, he was hooked. With ScreenSteps, Arlen's team of 37 students were now all able to create content. Not only did it take less time to create content, but they are all able to contribute more articles because ScreenSteps was so easy to use. An added bonus was that the articles were no longer stuck in a PDF. Even if we have awesome PDFs, they’re not searchable, so nobody is going to be able to discover them. Our PDFs were in the tutorials link from our main website. So that was difficult because you had to know how to get to the tutorial through all of those levels. In the old system, faculty and students had to click 3 or 4 times to find the article that would help them. But with ScreenSteps, if they have a question about how to randomize quiz questions, they just type in “Randomize” and they get an article for how to randomize quiz questions. And it’s right there. Faculty can click right on it and go right to it. In the old way, if a faculty member was looking for how to do something and couldn’t find it, they would call in and the support team would answer the question and then email a link to the PDF. So now, nobody has to guide them through that process of how to find answers. BYU – Idaho now has over 2,000 articles in ScreenSteps that are being used by thousands of faculty members and students across the globe. But Arlen is also quick to point out that a more robust knowledge base isn't the only goal. The goal is for faculty, students, and employees to be able to find help when they need it. And ScreenSteps is helping them do just that. Something our IT is trying to promote is this 0 level of support where the end user can do it at 2 o’clock in the morning in their pajamas in their bedroom. And not have to call someone or get dressed to go to the campus or the library. With ScreenSteps, they can now just find it on their own. Arlen's drive to offer great support to BYU - Idaho is what makes his department so helpful. ScreenSteps has simply made it easier for Arlen to execute his initiatives.